sign hung on the door. I had to know what was going to happen and I didn’t want any interruptions. Marita Hansen did not disappoint. I can’t wait to read the sequel. make Tama pay for what he did to his little sister. But Tama has eyes for Nike’s wife next and no one is safe who tries to get in his path. not the book for you. Lives are destroyed, whole families destroyed, in a matter of seconds because of selfish desires. I’ll read just about anything I can get my hands on and it had me cringing in a few places—-praying in others. I got attached to these characters in the short time it took me to read it and it hurt me when they got hurt. At the same time I’m being repulsed by what’s taking place, I’m also getting pulled in. It takes real talent to pull off a story like this. 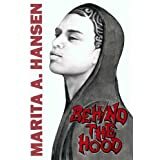 I can’t wait to read the next one by Marita Hansen. This story may take place in New Zealand, but the same story could be told in any gang territory in the States. Definitely earned the five stars I’m going to give Behind the Hood. Posted by Denna Holm on August 16, 2011 in Archives.